Obedience to those in authority and to the Laws of the Land is a necessity if peace is to be established. If the laws of the country are unjust, then they should be corrected, but not by divisive or violent measures. 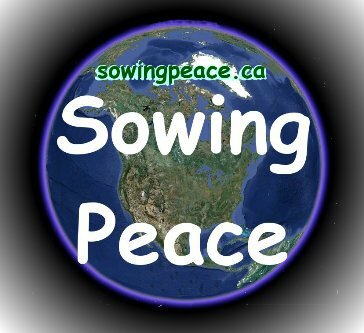 The Sowing Peace Initiative aims at changing human hearts to become peaceful. It does not lobby governments or engage in demonstrations. We are against no one. We encourage all to be peaceful within themselves and in their relationships with others. ‘Abdu’l-Bahá explained 100 years ago how our relationship to the government should be. The Bahá'ís must not engage in political movements which lead to sedition. They must interest themselves in movements which conduce to law and order. In Persia at the present time the Bahá'ís have no part in the revolutionary upheavals which have terminated in lawlessness and rebellion. Nevertheless, a Bahá'í may hold a political office and be interested in politics of the right type. Ministers, state officials and governor-generals in Persia are Bahá'ís, and there are many other Bahá'ís holding governmental positions; but nowhere throughout the world should the followers of Bahá'u'lláh be engaged in seditious movements. For example, if there should be an uprising here in America having for its purpose the establishment of a despotic government, the Bahá'ís should not be connected with it. The Bahá'í Cause covers all economic and social questions under the heading and ruling of its laws. The essence of the Bahá'í spirit is that, in order to establish a better social order and economic condition, there must be allegiance to the laws and principles of government. Under the laws which are to govern the world, the socialists may justly demand human rights but without resort to force and violence. The governments will enact these laws, establishing just legislation and economics in order that all humanity may enjoy a full measure of welfare and privilege; but this will always be according to legal protection and procedure. Without legislative administration, rights and demands fail, and the welfare of the commonwealth cannot be realized. Today the method of demand is the strike and resort to force, which is manifestly wrong and destructive of human foundations. Rightful privilege and demand must be set forth in laws and regulations. While thousands are considering these questions, we have more essential purposes. The fundamentals of the whole economic condition are divine in nature and are associated with the world of the heart and spirit. This is fully explained in the Bahá'í teaching, and without knowledge of its principles no improvement in the economic state can be realized. The Bahá'ís will bring about this improvement and betterment but not through sedition and appeal to physical force -- not through warfare, but welfare. Hearts must be so cemented together, love must become so dominant that the rich shall most willingly extend assistance to the poor and take steps to establish these economic adjustments permanently. If it is accomplished in this way, it will be most praiseworthy because then it will be for the sake of God and in the pathway of His service. For example, it will be as if the rich inhabitants of a city should say, "It is neither just nor lawful that we should possess great wealth while there is abject poverty in this community," and then willingly give their wealth to the poor, retaining only as much as will enable them to live comfortably. Strive, therefore, to create love in the hearts in order that they may become glowing and radiant. When that love is shining, it will permeate other hearts even as this electric light illumines its surroundings. When the love of God is established, everything else will be realized. This is the true foundation of all economics. Reflect upon it. Endeavor to become the cause of the attraction of souls rather than to enforce minds. Manifest true economics to the people. Show what love is, what kindness is, what true severance is and generosity. This is the important thing for you to do. Act in accordance with the teachings of Bahá'u'lláh. All His Books will be translated. Now is the time for you to live in accordance with His words. Let your deeds be the real translation of their meaning. Economic questions will not attract hearts. The love of God alone will attract them. Economic questions are most interesting; but the power which moves, controls and attracts the hearts of men is the love of God. Are being washed away by the tide of love. Are being erased by God above. CXLV. If ye meet the abased or the down-trodden, turn not away disdainfully from them, for the King of Glory ever watcheth over them and surroundeth them with such tenderness as none can fathom except them that have suffered their wishes and desires to be merged in the Will of your Lord, the Gracious, the All-Wise. 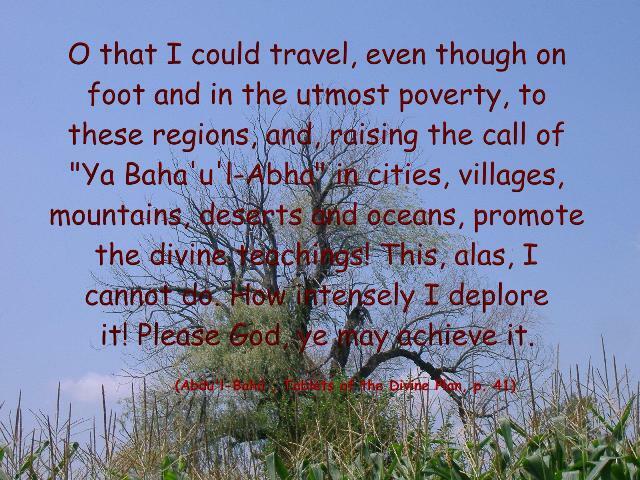 O ye rich ones of the earth! Flee not from the face of the poor that lieth in the dust, nay rather befriend him and suffer him to recount the tale of the woes with which God's inscrutable Decree hath caused him to be afflicted. By the righteousness of God! Whilst ye consort with him, the Concourse on high will be looking upon you, will be interceding for you, will be extolling your names and glorifying your action. Blessed are the learned that pride not themselves on their attainments; and well is it with the righteous that mock not the sinful, but rather conceal their misdeeds, so that their own shortcomings may remain veiled to men's eyes. In attempting to keep with my goal of starting a dialog of peace with those I meet I have met challenges strait away. Although most people are friendly and sympathetic to the goal of peace, there are also the down-trodden who are bitter with life and want revenge for the injustice that was committed against them. Yesterday, while traveling through some parks I talked to a few people that I met intent on inviting them to the July 20th event at Gibbons Park. Many would graciously accept the invitation with some excuse why they would not likely be able to attend, but would consider it if they are in the area at the time, so it was with a bit more bravery that I approached a group sitting in a circle near the peace gardens. I introduced myself and the Sowing Peace Initiative and was met with mixed interest. One lady took a card from me and showed some interest. One wanted me to guess his nationality. When I said “Ojibwa,” I think he was disappointed that I got it right, although he never confirmed or denied it. The conversation led to Columbus and I was informed that to celebrate Columbus Day was to celebrate genocide. I agreed, because I have read much about the genocide that followed Columbus discovering America. Great nations were wiped out and the remnant that remained was treated poorly. Today alcoholism, also brought by the European Settlers, ravages much of what is left of the aboriginal civilization of this continent. So the challenge is, “How do I as a descendant of these European Settlers start a discussion of peace with one who is a descendant of the defeated nation?” It is well with us to suggest that we put the past behind us and try to go forward learning from the past and not making the same mistakes again, but there is no way we can give life back to those countless numbers that were murdered in the name of progress. We can say that we are very sorry that it happened, but we are living off the spoils of war. We are living on stolen land that we worked hard for and paid for with our labour and earnings. Does the fact that we bought it from someone who bought it from someone make it any less stolen? The fact is that the original settlers originally purchase it from someone who had stolen it or they got a land grant from the invading government who took it from the original inhabitants. Yes, here is a great example of early justice. The original inhabitants, having been put into a desperate state by the invaders, are now offered blankets in exchange for their land. If this doesn’t sound unjust to you, then wait to you hear where the blankets came from. These were not new blankets by any means. They had been used by soldiers who died of smallpox. Now instead of going through the process of burning these decease laden items, they were used to purchase land. Of course the resulting smallpox epidemic wiped put much of a people who had little natural immunity to the deceases brought by the early Europeans. Over the last few years the injustices of the past have been acknowledged. Those who had committed the crimes are long gone as are the victims, but descendants of both sides now share a blood stained land. We are now all homeless wanderers who have no place to go. Do those who had their land stolen try to steal it back? If we are living on stolen land do we return it and become homeless ourselves? We are living is a very different society the one the early settlers found, but we are only here on this earth for a short time, so it doesn’t matter so much if we have a home here. Let us try to be polite and courteous visitors while we are on this planet so we can be welcomed to our true home when we leave. Labels: Call to Peace, Challenges in Starting a Dialog of Peace, Spiritual and Physical Healing., World peace forum.